The design and architecture agency COORDINATION ASIA joined forces with the management of the Shanghai Museum of Glass Park in 2011. 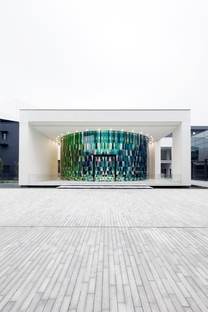 The design and architecture agency COORDINATION ASIA joined forces with the management of the Shanghai Museum of Glass Park in 2011. 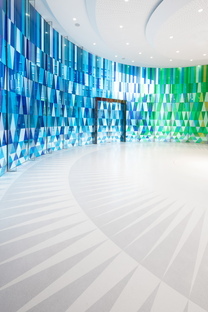 In addition to the Shanghai Museum of Glass Park, they have also designed other points of interest as part of their partnership, including the Rainbow Chapel. A fairy-tale venue for an important like a wedding: the Rainbow Chapel is a creative wedding chapel placed inside the Shanghai Museum of Glass Park. This museum park designed by COORDINATION ASIA on the site of the converted former industrial glass workshop where international artists exhibit their works and a workshop area with glass-blowing activities tells the story of this versatile material. 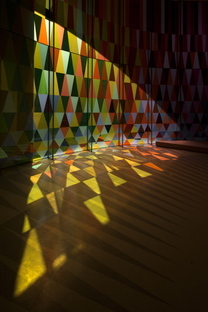 The white frame also emphasises the colourful facade patterns made of 3060 elements using 65 different colours, and the 6.8-metre high, semi-transparent kaleidoscope windows giving the chapel a happy vibe as the lighting changes inside with the sun's movement. To complete the offer, COORDINATION ASIA has converted the former glass workshop into an elegant, 1200-square metre banquet hall. So the Rainbow Chapel and the banquet hall together form a sophisticated event venue in the Shanghai Museum of Glass Park.